Dan and I just celebrated our 6-month wedding anniversary, and I’ve made what can only be described as a most stunning discovery: seems I’ve married under false pretenses. Now before you go thinking something like this is going to happen, let me explain. 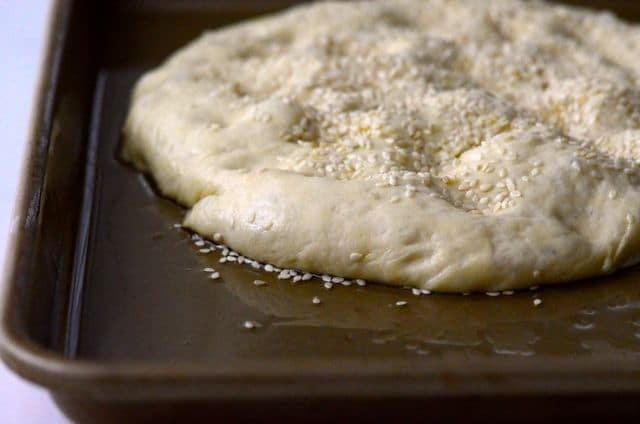 Most everyone who spends even a short amount of time in my kitchen, especially when I bake bread, knows that I’ve been searching, hunting, refining, and driving myself to the brink of crazy for the perfect Lebanese talami bread recipe. I’ve forced myself on any member of the local Lebanese Farhat family I come into contact with, scrapping for another detail about about how they achieve their ethereal, truly heavenly talami. To say I’ve begged would not be an exaggeration—sometimes with success, sometimes no. Last summer when I went to Philadelphia for the photo shoot for my upcoming Lebanese cookbook, I visited with one of the Farhats there, Abouna Vincent, who showed me around his Maronite church and took me out for a spectacular Lebanese dinner (they do Lebanese so well in Philly). 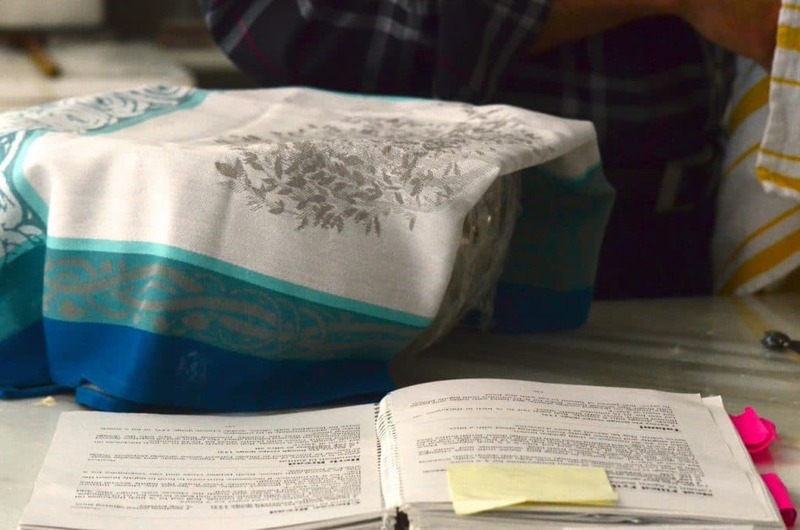 Little did he know that I was going to corner him, quite literally, with stiff glasses of arak, to capture his every word on video and paper about how he, a direct descendent from his famous cook-mother, makes the bread. How could he refuse? He’s a priest after all…. At home, I’ve made talami after talami after talami. It is, I will say, very good. So I’m not complaining, or insinuating that it’s anything but delicious. The recipe in my cookbook is even further refined from the recipe on my blog, based on what I’ve learned. Every time I bake the talami, my Lebanese husband says how great it is in its own right, that I don’t need anyone’s recipe for it. He takes photos whenever I bake and sends them out to make everyone jealous that he’s eating warm talami from the oven. But still. I couldn’t let go of the search, wanting more air in the bread, more tenderness, more moisture. Perhaps the search for perfection had become as meaningful for me as finding perfection itself. Perhaps I didn’t really want or need to find the answer; perhaps I just wanted to keep the hunt alive. That, I believe, must be what Dan has been thinking all this time … keeping his own talami recipe quiet. Under wraps. A secret. A false pretense. Either he didn’t want to burst my search bubble . . . or his hallmark modesty kept him from nudging me away from the oven for a few hours . . . or (benefit of the doubt be damned): he enjoyed watching me squirm, watching my talami torment, knowing that in his talented hands he carried the formula for some of the finest talami any one of us has ever tasted. The jig was up for the mister when our friend Kris recently told me he’d been talking with a Farhat who said he just might be willing to share some more secrets with me. Dan overheard and commented, loudly, that my talami is great and I don’t need more secrets. Kris overheard that and said everyone knows that Dan Shaheen makes a mean bread himself. Dan looked like someone caught in the act. Who are you? I whispered. And what is this bread? 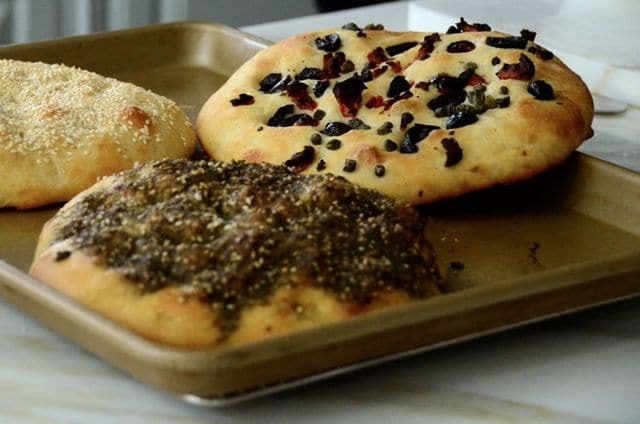 A few weeks later, on a cold Sunday made for a bread-bake, Dan asked after some talami. Ohhhhhhnoyoudon’t, I said as I started lining up the ingredients for him. It’s all you. No more talami secrets, my friend. As I watched and took photos, I found myself suggesting he change from his clothes, or put on an apron, or knead the dough like so. He wouldn’t have any of it, and he was right on: This was his talami to bake. We ate the resulting Lebanese bread like wide-eyed wolves. Even Dan seemed to have surprised himself with it. 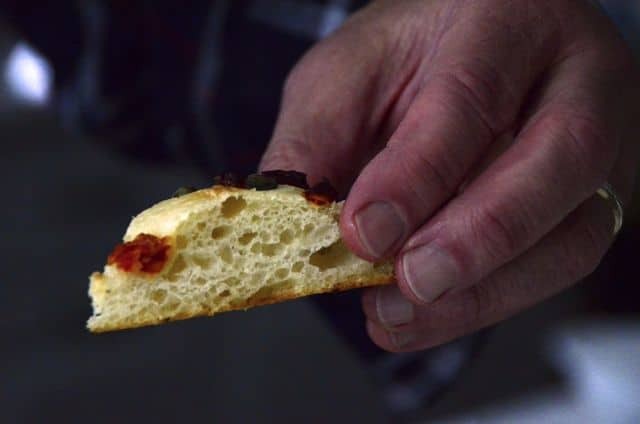 The texture was tender and moist with big billowy air pockets and the perfect, chewy crumb. A heaven. I nearly slapped Dan’s face, Loretta-style from Moonstruck. But then, you know how that story goes. It ends pretty well. Now I can’t wait to see what other Lebanese recipes Dan’s keeping up his sleeve. Who knows, maybe he’ll even write a cookbook someday. The egg in the dough makes this bread extra-tender and special. 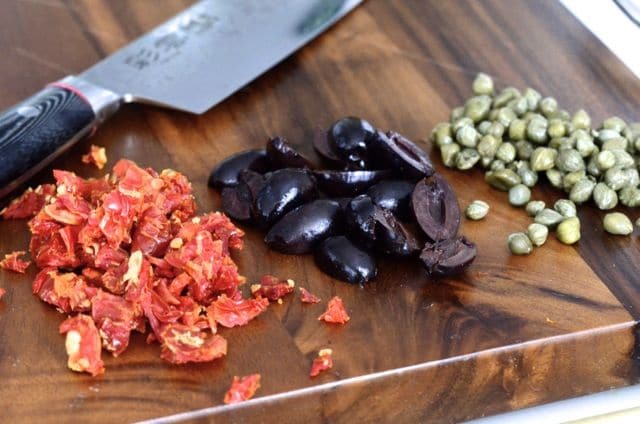 Dan likes to combine the olives, sun-dried tomatoes, and capers to top the talami. In a large bowl, dissolve the sugar and yeast in 2 cups of the warm water. Let it rest for about 5 minutes, until the yeast is creamy and slightly bubbly. Stir in the oil, salt, and egg. Mix in the flour, a cup at a time, until there are no lumps and a wet, sticky dough has formed. Add about ¼ cup more water as you go as well. 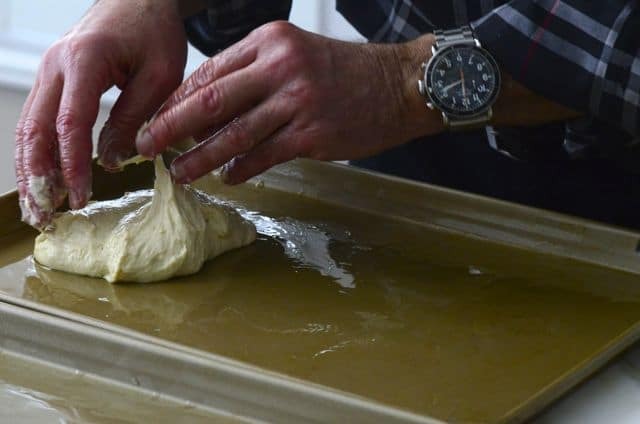 Rub the dough and the sides of the bowl with a tablespoon of the oil, reach under the droopy dough to rub oil underneath it as well. Cover the bowl with plastic wrap (without letting it touch the dough) and drape a kitchen towel over the top. Let the dough rest in a warm spot for about 45 minutes. Heat the oven to 450° F. Rub a tablespoon or so of oil on two rimmed sheet pans. Divide the dough in quarters and form each one into a round, 2 on each pan. 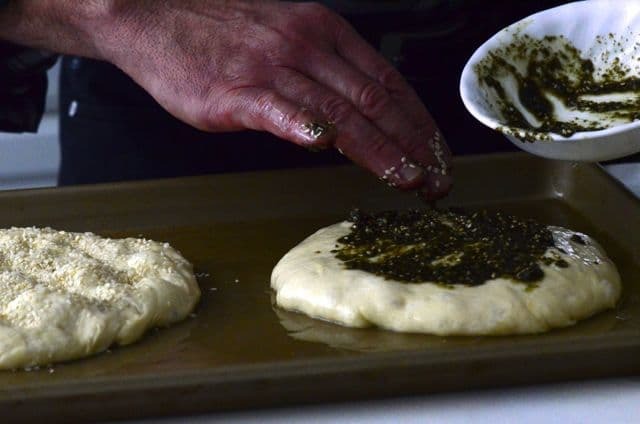 Rub more oil over the tops of the dough and let them rest for another 15 minutes. If you’re using toppings, push them into the top of each loaf, making dimples with the tips of your fingers. Make the dimples even if you're not using toppings. Bake the bread, one pan at a time, for about 10 minutes, or until light golden brown. Cut or tear off pieces and eat warm; the bread is best right now. To store the bread, wrap room temperature bread in plastic and aluminum foil for a day or so. 22 Responses to "Danny Talami"
Its amazing what secrets people keep from us. 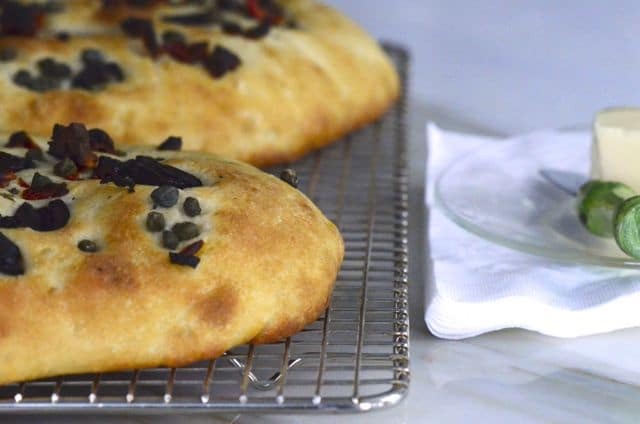 I loved reading this recipe and as soon as its out of subzero temps, I’m headed to the store. Happy 6 month anniversary. You are just blooming! Wishing you two the very best. What an amazing recipe, I love everything about it, and shall add it to my Pinterest board right away! Oh my goodness, you’re killing me here. Your photos are so lovely–I can smell the smells and taste the briny olives. YUM. Dan, your bread is beautiful–just like my Dear Mother used to make so I know it is heavenly!! Maureen, isn’t it great fun to have a partner who never ceases to amaze?!?!?! Happy New Year to Dan and Maureen! Loved this story!! 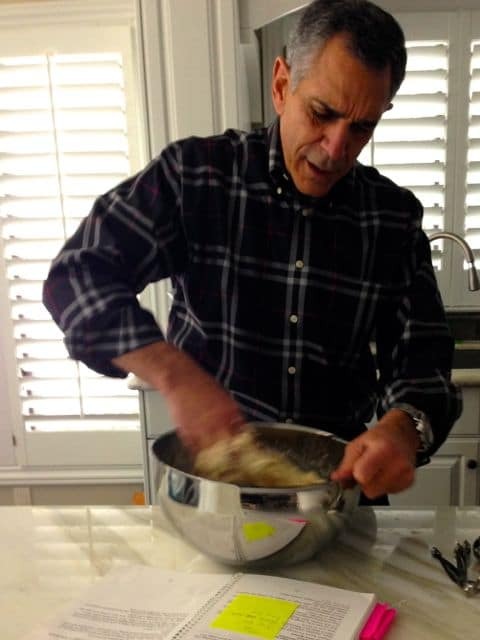 So funny we had the same discussions at Christmas dinner and decided we would send our brother in law on a mission to get David Farhat’s recipie… As we all agreed his is by far the absolute best ever!! Looks like the recipie and methods of their famous cook-mother hold true – hope you had success getting that recipe — be well.. Yes, he does make great bread. but, he doesn’t share it with his brother. I think he is getting back at me for making him swim in lake Charlevoix. Currently on a diet to lose all the weight I gained over the holidays, but I will try this recipe as soon as I can. When I make bread, I use the basic bread dough recipe from Lebanese Cuisine by Madelain Farah. I save out two balls to prepare with Zatar; one for me and the other for my sister-in-law. The recipe is very similar to Danny’s except his has egg and oil and mine has milk. I can’t wait to try his recipe. Thank you and keep up the good work. Looking forward to April release of your new cookbook. Nice work Danny! some man-bread for the man-cave. 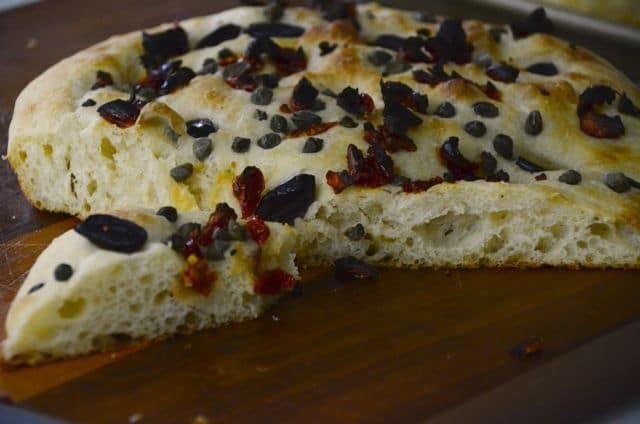 My son loves this bread,thanks so much for the recipe! I have bought 4 of your cookbooks in advance. Can’t wait! I visit Philly often….would you please email me the name of the restaurant as I do not live in PA? We have an upcoming graduation and I would like to treat our guests to a great meal. Thank you. Maureen that looks great! You didn’t need to corner me and yes how could I say no to you! And Maureen C jr. you are correct—my brother David’s bread is the best. He is number 1! I would love to know who taught him how to bake that? :)) Ask him sometime! Happy New Year. You’re the best, Abouna Vince! Can’t wait to try the recipe!! I’ve been wanting to try for awhile your Uncle Jim’s recipe but when I saw Danny’s I decided to try it because of the lesser amt of flour. I used your husband’s recipe as it called for a lesser amount of flour because I wanted to try making the dough in my bread machine on the dough cycle which I did and it worked beautifully. Boy that is a wet dough! Anyways, I had my father who is half Lebanese help me and we put out 4 wonderful loaves. He said my great-grandmother used to make the bread all the time using a wood-fired stove. We had a fun time making the bread and even had time for a cribbage game waiting for dough to be ready! Thanks so much for your great blog and sharing your recipes. I look forward to buying your cookbook when it comes out! This bread would be delicious for an employee-appreciation event! this is one of the best bread i ever tasted, thanks alot for the recepie ! Hi Maureen you write so beautifully I salivate as I am reading can almost tast what you sharing. How wonderful Zohra, thank you so much! Danny’s dough is kneaded, but it is a wet dough so the kneading is a sticky affair and I do it right in the bowl.